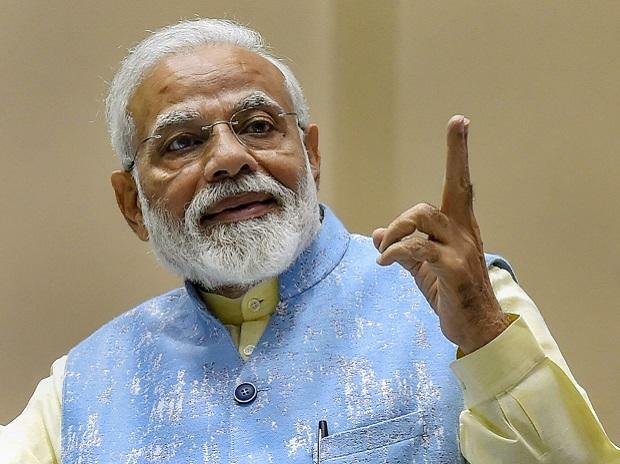 Prime Minister Narendra Modi urged people of Karnataka on Wednesday to elect a full-majority government in the coming Lok Sabha election, stressing that a "mahamilavat" (highly adulterated) dispensation would deliver half results. He also slammed Opposition parties' efforts to form an anti-BJP alliance as "politics of selfishness" and said they were guided solely by the agenda of "Modi hataao". Reminding people that the country got a full-majority government in Delhi after 30 years, he said, "If it (the government) were half and incomplete, it would have performed half and incomplete. This (government) is complete, it completes its works." "This is why Modi has become a reason for worry to them. Day and night, they indulge in one job 'Modi hataao'," he said. At a public rally in the bastion of Mallikarjun Kharge, the leader of the Congress party in Lok Sabha, Modi spoke about India's "dum" (guts) today, apparently referring to the IAF strike on a terrorist camp in Pakistan. "It was not because of Modi but because of the (resolve of) 125 crore people," the prime minister said. He said that while he was working to stamp out terrorism, poverty and corruption, opposition parties were coming together to remove him. Cautioning people against "mahagatbandhan" (grand alliance), which he called "mahamilavat", Modi said leaders doing politics for their families are not liking the 'New India' and its new policies. "They fear a majboot (strong) government. Hence, they are looking for a majboor (helpless) government," he said. Citing Karnataka, where he claimed is a "helpless" government, Modi said the alliance partners Congress and JD(S) were pulling themselves in different directions. "One pulls here, the other pulls there. One says give me this much, the other says you gave him two, give me four, then third demands eight," the prime minister claimed. Modi called Karnataka Chief Minister H D Kumaraswamy a "remote-controlled CM," alleging he was being dictated by the Congress. "Karnataka is in a bad state. Can we allow the state of the country to get bad to," he asked the crowd at the rally. "Do we have to save the country or not? Do we have to take this country forward or not? Make it strong or not?... Protect the country and protect its pride," he asked. "Sometimes small mistakes cost us a lot," he said. Modi also spoke about the steps taken by his government to plug leakages in welfare schemes and the transparency brought in to ensure that the funds reached the poor directly. "You will be surprised, in these fake or bogus names Rs 1,10,000 crore was going into the hands of middlemen every year. Now it has stopped." "Now you tell me, those who were getting Rs 1,10,000 crore...will they say Modi zindabaad? Won't they abuse Modi? Do I have to fear their abuse? Amid a shout of support from the crowd, Modi asked them, "You are with me, right? Why should I fear?" "If one has the blessing of 125 crore people...he will never fear," he said. "India has given me this strength... 125 crore people have given this strength. The dum-kham (guts) that the world is witnessing, whose is it? This dum is not Modi's, this dum is of 125 crore people of India," he said. The prime minister was apparently referring to the air strike by Indian Air Force on a training camp of Jaish-e-Mohammed terrorist group in Balakot on Feb 26. The Indian air strike on the JeM camp came 12 days after the terror group claimed responsibility for a suicide attack on a CRPF convoy in Kashmir in which CRPF 40 soldiers were killed. Taking on the Congress-JD(S) coalition in Karnataka, Modi alleged that the Congress had come to power by "backstabbing" people of the state and the chief minister had not sent a list of farmers to the Centre for the recently launched Pradhan Mantri Kisan Samman Nidhi Scheme. Modi said Karnataka's about 71 lakh farmers would benefit from the central scheme. "Those who are indulging in corruption, are doing injustice to farmers of Karnataka. I want to tell them that if they stand as a wall between the rights of farmers of Karnataka, farmers of Karnataka will demolish it," Modi said.